Having troubles carrying your phone together with your cards ? Get tired of the bulky wallet ? Here is one of our unique designs of a smartphone holster for men. 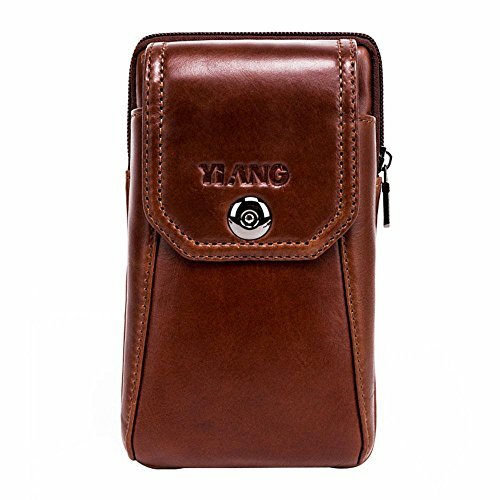 This is made for the convenience of man on having a carry case with belt clip.Having this kind of holster will definitely give you the convenience you need when working, traveling or doing your everyday activities. Very light weight and simple design, you don't have to carry your wallet if you have this in your belt. Has easy access to driver license, ins cards and credit cards. It can hold credit cards, driver's license,cash.cellphone,sunglass,cigarette,lighter,etc. 1.The feature of crazy-horse leather is that leather items may have wrinkles, scars, scratches that are inherent characteristics and natural beauty of the hide to present the style of retro and wildness. When you scrape it widely, the trace will appear. If the trace is not obvious, you can wipe it gently and then the trace will be less. 2.There may be a bit leather smell when get the wallet, since it's a new & unused leather product. You could open the package and put it in a ventilate place for a few days, then the smell will fade away. Size info : 18 x 11 x 3.5 cm It's big enough to store your cellphone , but small enough to fit on your belt. Structure : 1 x front zipper pocket,1 x main zipper pocket.Compatible with: iPhone 8/7plus/7/6splus/6/Samsung Galaxy Note 5,Note 4,Note 3 ,Note Edge,S6 Edge Plus and other size smartphones. Multipurpose : It can hold credit cards, driver's license,cash.cellphone,sunglass,cigarette,lighter,etc.More and more people don't like carrying a bulky purse or wallet when you go out,watch a movies,have a date,take in a party,walk a dog....So this case will be great for your choice!